Recently finished Marshall Goldsmith and Mark Reiter’s What Got You Here, Won’t Get You Here. It was cited in a meeting with a startup cofounder as a helpful book for his own success (and his company’s). Off the bat, I was expecting a busy book of sorts, but instead, realized that the “You” in the title was more about YOU. The context shifted quickly, and I wasn’t prepared for it. Meanwhile, I didn’t know what to expect, let alone chapters and break-downs of how those who wish to ascend to greater success must constantly improve… starting with the things that – shall we say – rub people the wrong way. Yes, the book actually delved into character faults. Goldsmith dives into 20 habits/ faults/ common rubs describing situations, ways to catch them, importance of resolving, resolutions, and some anecdotal results. 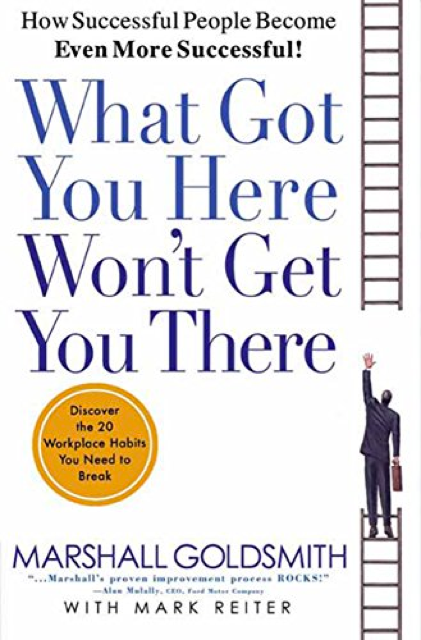 The book starts out acknowledging readers and leaders have all reached where they are, but that it may not actually help get them to the top. Oftentimes, folks who have been successful can attribute their success to personal talent and achievement. However, as they ascend, their influence commonly spans wider audiences. This can amplify personal habits that could stifle further progression. One of the keys Goldsmith talks about to assess habits that negatively impact others including the self is surveying folks across the organization who come in contact and even those beyond – at home, as one example. Usually, this scope of feedback is much wider and deeper than what one may expect or ask – consider a leader who is looking to improve him/ herself. In this case, their list of folks to canvas would often times be much narrower focus than who Goldsmith would approach. This provides a holistic view that can identify habits’ reach and effect. Per earlier, there were 20 habits mentioned. I read this book over a couple months, and admit I couldn’t recall many of them. However, as I look at a book summary to help jog my mind, I remember each easily. The habits are… not necessarily anything new. However, like many great minds, Goldsmith is able to put structure to habits to construct this list. “Speaking when angry.” I just did this. I’ve been frustrated with a doctor’s office as I’ve been dealing with a chronic neck pain (herniated disc). When a doctor’s assistant called me due to a legitimately good reason (I could die without recognition of this), I responded very short-tempered. I was angry. I was tired of being passed around. I shouldn’t have. “Neativity, or ‘Let me explain why that won’t work’”. This is something I have done, too. As I continue to lead and manage others (or have any relationship with others), I can be quick to jump to conclusions or express why others’ ideas won’t work. It’s unfortunate as I can stifle the others’ creativity while closing me off to new perspectives. “Refusing to express regret”. This isn’t done enough – I regret… I’m sorry… I talked to the doctor’s assistant the day after and apologized. She was just the messenger. “Not listening”. Listening lets me absorb and learn. It can be done passively and actively. If I’m always pushing my thoughts, I don’t learn. I don’t expand my domain. “Punishing the messenger”. Yeah, I just did this. See the story above. Maybe it’s moments like this that crystallize in me of how easy it is to keep doing the negative habits that will prevent me from being who I want to be. “Failing to express gratitude”. It’s easy to live life and take things for granted – many times from the people who are closest to us (me). I feel that I should remember that each relationship is precious and must be constantly earned. There are a lot of habits. Goldsmith did not offer a solution that I found to be effective to absorbing the habits, let alone being cognizant of them. Like the sales books (e.g. the Challenger Sale, SPIN), I can’t try to improve on everything. Instead, I have listed a subset of the habits that resonated with me most. I will work on the subset (or a subset of the subset). It takes practice. It takes diligence. However, my “There” is not that far, and I need to be ready to grasp it when it’s in front of me. What Should You Stop to be Successful? 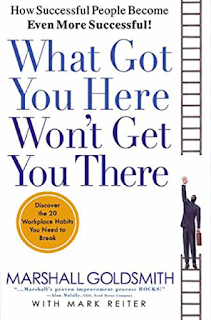 I’m reading Marshall Goldsmith’s What Got You’re Here Won’t Get Your There, and early on, Marshall talks about the importance of what gets stopped. We often hear of the successes of others. As Marshall points out, though, there are many reasons why successful people succeed. What is oftentimes just as important (if not more so) and is not talked about is what successful people STOP doing. What entrepreneurs may stop, for example, is down a path that would not yield successful outcomes. Successful startups are known for their successes; rarely for their failures or what they do to shift their focus. Marshall writes how people try to change habits and create great processes. This can be challenging, however, with several steps required. Instead, folks could be better off by focusing on small things to STOP doing. Oftentimes, this is just enough to create noticeable, positive results. When I read all of this, I think about self-awareness, being comfortable with the uncomfortable, and making small changes for sustainable effects. Case in point: I hate vegetables. I really do. However, I realize the importance of eating vegetables for their nutrients. To change this, many people think about the need to make big changes – start eating a lot of vegetables. For me, I realize what I really want to do is to be open to eating vegetables – not be scared off by them. For me, I’m indeed adding a vegetable a day as part of a “30 Broccoli, 30 Days” challenge – consuming broccoli florets daily for 30 days. I’m not going for a lot because I know me well. Meanwhile, the goal here is not to be a vegetarian or to even start eating a lot of vegetables – that just wouldn’t be me (read: hardly sustainable). Instead, I want to STOP ignoring vegetables on my plate (or throw them away ?). I want to be a better writer. I realized early on how often I use “so” in my writing. Now, I’m aware of this and am limiting (“stopping”) how often I use the word. I am also working on STOPPING filler words in my speech. I’m not trying to improve how I speak by taking speaking courses or studying a thesaurus. Instead, I’m stopping what I feel is not productive for effective speakers. Think about yourself. Think about what you want to improve. Think about what you want to STOPrather than what you want to do. http://www.daryllu.com/wp-content/uploads/2018/10/entrepreneurial-ninja_logo_sm.png 0 0 Daryl Lu http://www.daryllu.com/wp-content/uploads/2018/10/entrepreneurial-ninja_logo_sm.png Daryl Lu2017-09-21 10:50:002017-09-21 10:50:00What Should You Stop to be Successful?